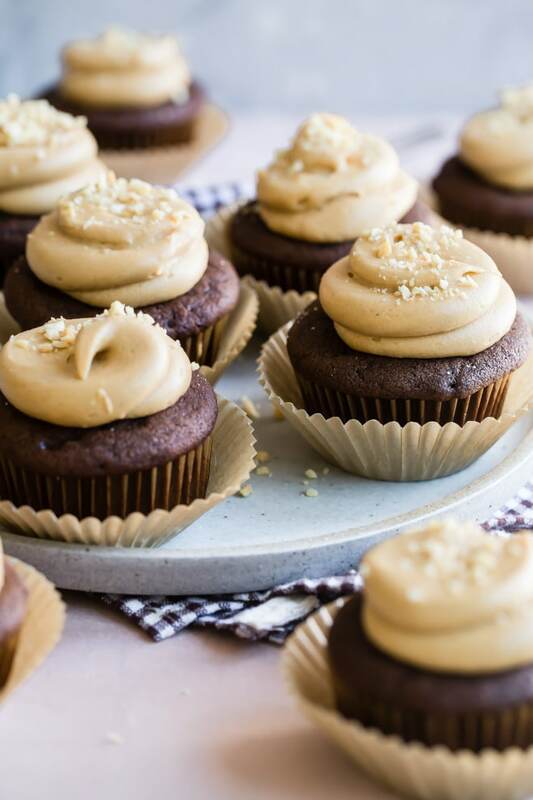 Peanut butter and chocolate are the lifelong besties of food, and these homemade Chocolate Cupcakes with Peanut Butter Frosting will prove it. Deep, dark buttermilk chocolate cake slathered with a soft and creamy peanut butter frosting…what a beautiful friendship. 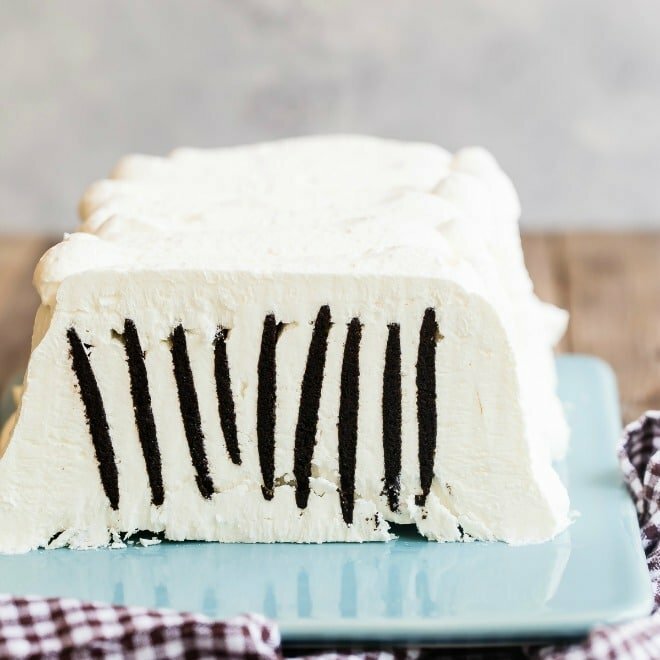 Bring a batch to your next party, but only if you want to delight absolutely everyone in the room. Lately, I‘ve been living by these words: Make It Count. In life, in work, and yes, even in food. Some fancy cupcakes look great, but by the time I put down my fork, it didn’t seem quite worth it. 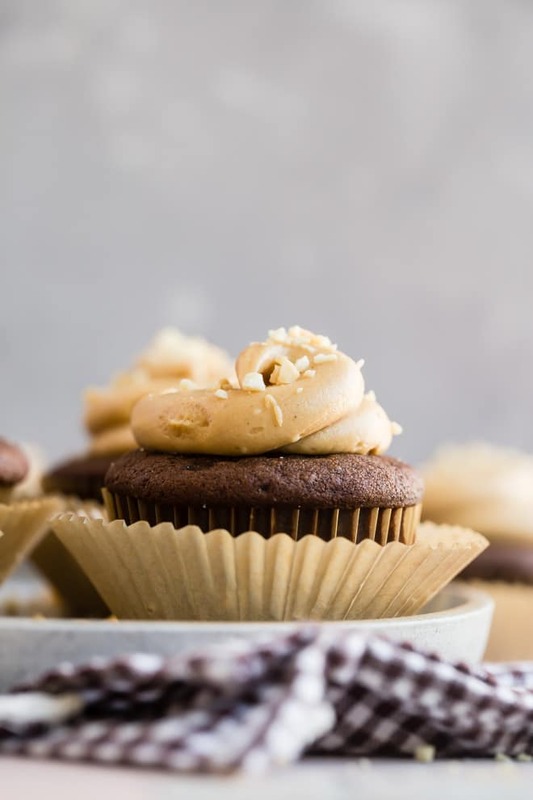 And while this may just look like just another ‘best homemade cupcake recipe,’ look a little closer—it has all the sophistication of a real chocolate cake, just…smaller. 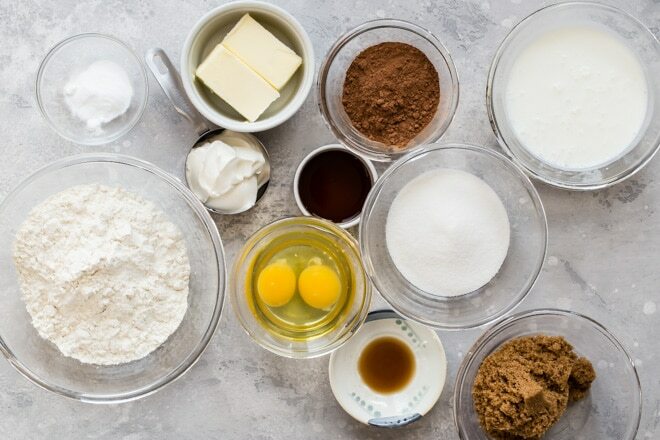 If you’re dreaming of chocolate cupcakes, ingredients matter. 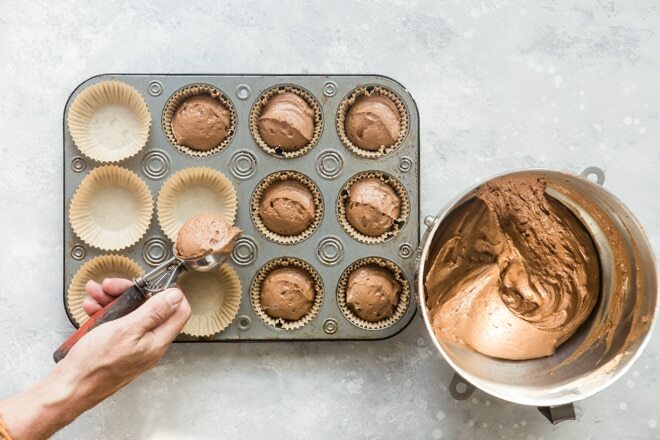 This recipe pulls out all the stops to ensure the most tender and luscious made-from-scratch chocolate cupcake imaginable. 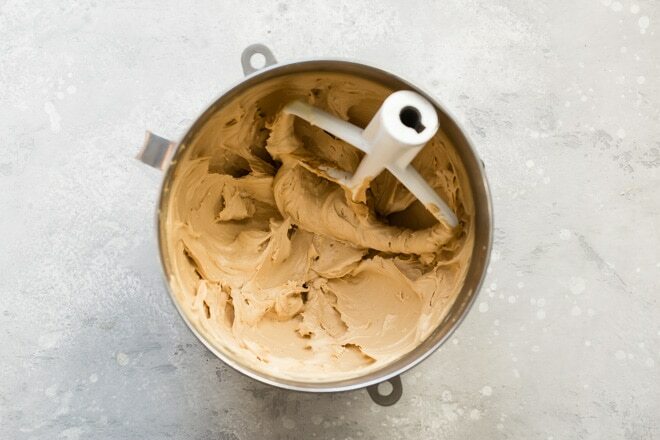 But it doesn’t stop there; I show you a super-easy peanut butter buttercream (can I just say peanutbuttercream?) that is, literally and figuratively, the frosting on the cake. If you want to make it count, you couldn’t do better than these cupcakes. Want to bake Chocolate Cupcakes for 100? Click and slide the number next to “servings” on the recipe card below to adjust the ingredients to match how many you’re feeding—the recipe does the math for you, it’s that easy. First, brew some strong coffee, or grab an extra shot of espresso from your favorite coffee place. With an electric mixer, cream the butter and both sugars until light and fluffy. Add the eggs, one at a time, and then the vanilla. In a separate bowl, mix together the sour cream (gasp!) buttermilk, and that coffee you brewed. In yet another bowl, mix together the dry ingredients: flour, cocoa powder, salt, and baking soda. Take turns adding the wet ingredients and the dry ingredients to the butter and sugar mixture, while the mixer is on low speed. Don’t add everything at once, though, try to space it out into three batches. Mix until just blended. Measure out 1/2 cup batter into each cupcake cup. I like to use cute cupcake liners, like these. Bake at 350 degrees, for about 25 minutes, until a toothpick inserted in the center of a cupcake comes out clean. While the cupcakes are baking, it’s time to make the frosting. 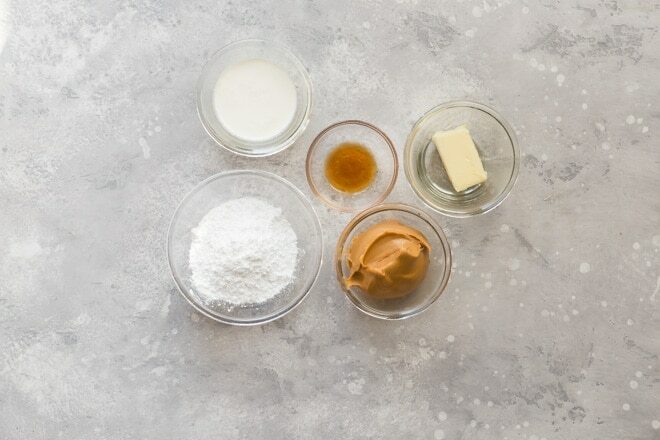 To make the best peanut butter frosting you’ll ever have, mix together the peanut butter, powdered sugar, butter, vanilla, and salt with an electric mixer. You may have to scrape down the sides of the bowl, because this part can get sticky. Once that’s blended, slowly add the heavy cream. Beat on high speed until silky and smooth. What can you use as a substitute for buttermilk? For each cup of buttermilk, you can use 1 tablespoon of white vinegar or lemon juice plus enough milk to measure 1 cup. Stir, then let stand for 5 minutes. You can also use 1 cup of plain yogurt or 1 3/4 teaspoons cream of tartar plus 1 cup milk. Some people use a good quality plain, unsweetened yogurt in place of buttermilk, volume for volume. 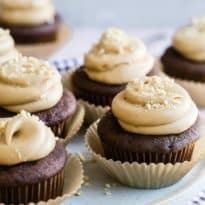 Can you make this Chocolate Cupcakes recipe eggless? Unsweetened applesauce: Using one-fourth cup of applesauce in place of one egg will work. Banana: Using one-fourth cup of ripe, mashed banana in place of one egg might be a nice substitution. Make a chia seed or flax seed egg: To replace one egg, whisk together 1 tablespoon of ground chia or flaxseeds with 3 tablespoons of water until fully absorbed and thickened. What is the best cocoa to use for baking? I love a deep velvety cocoa like the kind Guittard makes. It can be found online, and it also makes phenomenal hot chocolate. What other frosting can you use for Chocolate Cupcakes? Two of my favorites, just in case you have to have the cupcakes but want to pass on the peanut butter. Combine sugar, butter, milk and vanilla. Beat on medium speed until smooth and fluffy. Spread over cupcakes. Store in refrigerator. Combine coffee and cocoa in small bowl of electric mixer. Add sugar, butter, salt, and vanilla. Beat until blended. Scrape bowl, and beat icing until it is smooth and spreadable. In the bowl of an electric mixer fitted with a paddle attachment, cream butter and two sugars on high speed until light and fluffy, about 5 minutes. Lower the speed to medium, add eggs one at a time, then add vanilla and mix well. In a separate bowl, whisk together buttermilk, sour cream, and coffee. Then in another bowl, sift together flour, cocoa, salt, and baking soda. On low speed, add buttermilk mixture and flour mixture alternatively in 3 batches to mixer bowl, beginning with buttermilk mixture and ending with flour mixture. Mix only until blended. Fold batter with a rubber spatula to make sure it is completely blended. Divide batter among the cupcake pans, using about 1/2 cup batter per cup. Bake on rack in the middle of the oven for 25 minutes, or until a toothpick inserted in the center of the cupcake comes out clean. 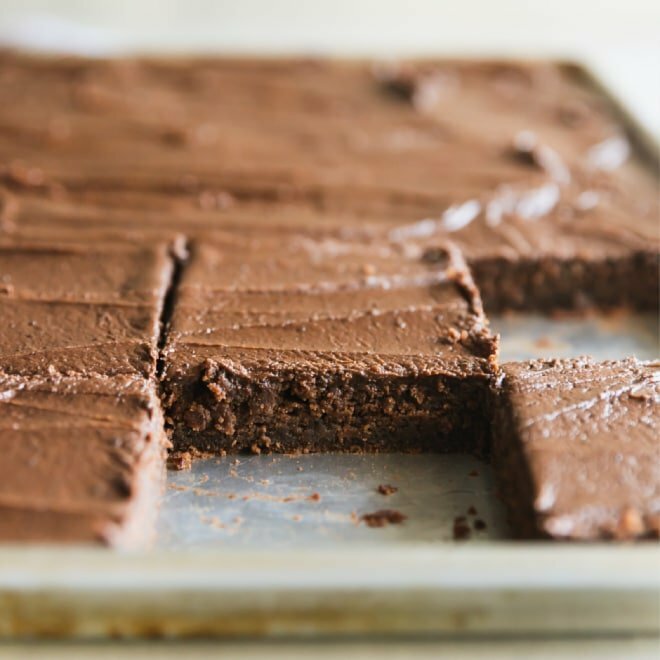 Cool for 10 minutes, remove from pans, and allow to completely cool before frosting. Place the powdered sugar, peanut butter, butter, vanilla, and salt in the bowl of an electric mixer fitted with a paddle attachment. Mix on medium-low speed until creamy, scraping down sides of bowl with a rubber spatula as you go. Add cream and beat on high speed until mixture is light and smooth. 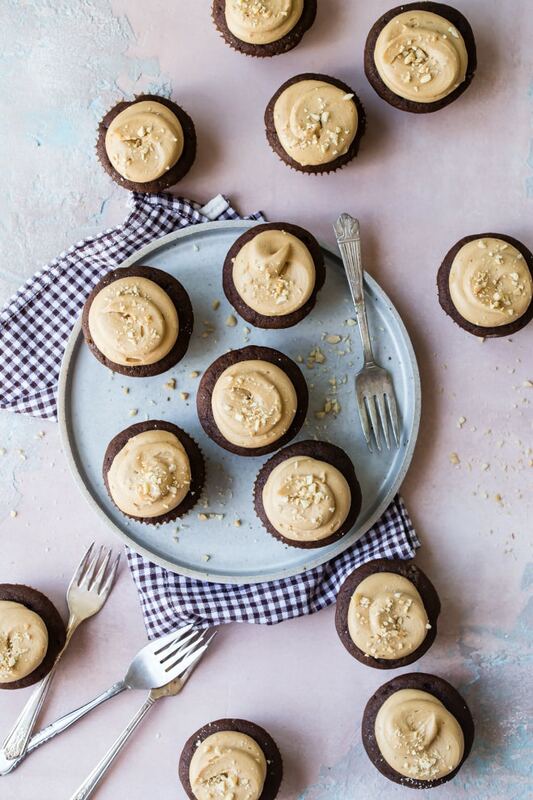 When the cupcakes are completely cool, frost each cupcake with peanut butter frosting and sprinkle with chopped peanuts, if desired. Oh my. I’m running to the kitchen! Would you recommend regular or dutch process cocoa? Thank-you in advance. 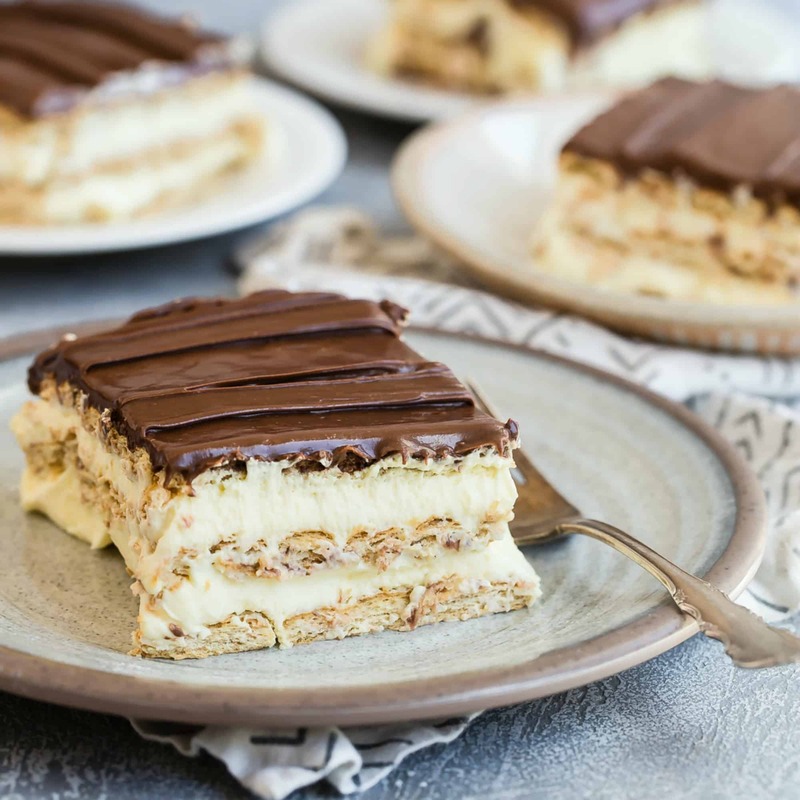 love and trust your recipes!